Taste test: Recently called 'The Mack Daddy of all Snacks' by our friends at the Phantom Gourmet, Cooler Ranch Doritos recently shrunk in size to fit into a can! Even though they're smaller, you can't tell the difference, and you can use the top as a cup can. Still has the same great Cooler Ranch taste. Smell test: They smell like every other bag of Doritos on the planet. 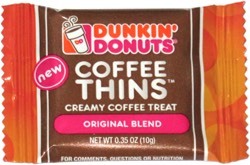 This snack was discovered by Keith and Melissa at Price Chopper, Worcester, Massachusetts. Review published .